Teasers are provocative statements, sometimes called “hooks,” that serve to grab students’ attention and draw them into the upcoming lesson. To be most effective, the teaser must clearly relate to the subject matter and it must deliver. If you use a teaser that makes students wonder what the heck you’re talking about, it will simply confuse rather than pique curiosity. And if your lessons don’t live up to the hype you’ve built, the anticlimax will eventually cause students to tune out. A classic way to begin class is to ask a question that creates a compelling need for students to know the answer, appealing to what Carnegie Melon University professor George Loewenstein calls the “curiosity gap.” You could also begin with an unusual photo, humorous video clip, perplexing statement, or a shocking statistic. I once had a professor who began each class with a promise, such as “by the end of class today, I promise you will be equipped with three strategies for handling passive-aggressive people.” He told me that making such promises gives students confidence that they will leave each class with something useful and it also holds him accountable for reaching those objectives. You are probably much more organized than I am, but I sometimes feel like my lectures lack enough structure and, therefore, veer off course. One strategy to address this comes from James Lang, author of Small Teaching. He suggests providing students with a few questions to guide their homework and asks them to bring their responses to class. Ideally, the questions you ask cannot be answered by simply looking up a definition in the textbook and also require students to connect the current topic with those you’ve discussed previously. At the beginning of the next class, display those questions so students can refer to them as they enter the classroom and get settled. As you take attendance and complete other housekeeping tasks, ask students to turn to a neighbor and share their responses. Then, towards the end of the period, return to the questions and ask if students’ responses have changed since listening to your lecture. This could spark discussion or serve as an exit ticket. Using these questions at the beginning and end of class metaphorically “closes the circle” and reminds students that each session has a clear purpose and structure. Another memory recall strategy is to simply ask students to remind you of the key points from the previous class period. But rather than calling on a single student, consider asking all students to participate such as prompting them to complete a “minute paper,” draw a process, create a diagram, or illustrate a main point. Any effort students make to recall course content — without the help of notes or textbooks — benefits their learning. No matter the strategy you choose, I challenge you to put more thought into how each of your class periods begin. 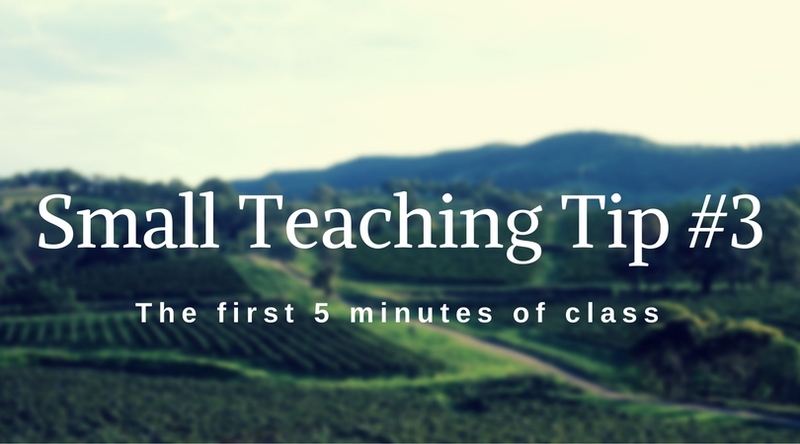 Those few minutes offer us a fertile opportunity to build anticipation and prepare students for learning. How do you start class? Please share! This post is part of a series which will present low risk, high reward teaching ideas. Inspired by James Lang’s book Small Teaching: Everyday Lessons from the Science of Learning, this series will inspire you to implement small but powerful changes to your teaching.